So your child likes a lot of different things. Maybe he doesn’t want to decide on just one theme for his party. That’s fine! We recently planned a fabulous party that had not one theme, but three: Pokemon, sports, and animals! We think it’s really cool to have such an eclectic mix of items at a party—because in the end, you might say the theme was the birthday boy himself! Want to throw a circus themed party, but the Big Apple Circus is out of town? No problem! 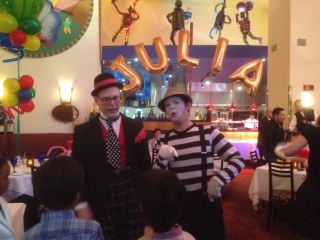 There are many other ways to bring the circus to your child’s next birthday party. Here are some ideas from one of our recent parties. The venue, a circus-themed restaurant with whimsical sculptures and an array of bright colors, couldn’t have been more perfect! But what’s a party without balloons? For this party, we kicked it up a notch with festive balloon trees and our personal favorite: the birthday girl’s name in golden balloons across the back of the room. The golden letters created eye-catching central point for the decor, turning the space from a restaurant into a personalized party haven. Happy Spring to you all from Linda Kaye’s Partymakers. As the weather starts to break and we catch glimpses of the spring breeze, everyone starts to get into a festive party mood. Whether it’s a child or adult’s birthday party, a corporate picnic or an annual family gathering, we have everything you need to plan a fabulous event in New York or even a summertime event in the Hamptons. Custom parties have become quite popular over the last year and if you’ve followed our blog, you’ll see that we’ve gone above and beyond the stars to plan fabulous and unforgettable parties. This party was a clever combination of Ninja Worriors and Lego, or as some would know it Ninjago! Partymakers collaborated with a very creative mom to create this fabulous party for her son’s 5th birthday! Dive in and take a peek at our most stellar intergalactic adventure!! A fabulous Star Wars party that will blow your socks off! A lucky little boy turned 6 this month and his party theme was Star Wars. Linda Kaye’s Partymakers brought in all sorts of fun entertainment!